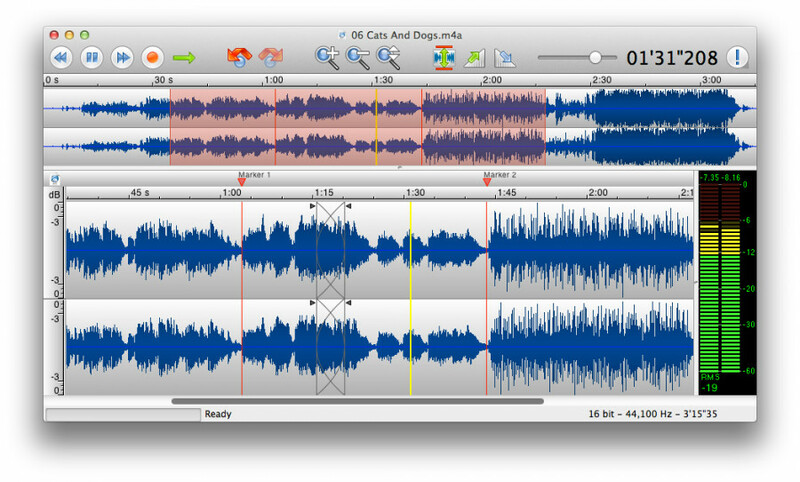 TwistedWave 1.3 is audio file recorders software developed by TwistedWave. TwistedWave is a very easy to use and powerful audio editor. It supports Audio Unit plug-ins and many file formats, including wav, aiff, caf, mp3, mp4, FLAC, Ogg/Vorbis. Good multichannel support: you can apply Audio Units to a selection of channels. Unlimited undo and redo which works instantly. Zooming in and moving around the waveform is very fast, even with very large files. All the effects are applied in the background, saving a lot of time. This program is shareware, which means you can download and use TwistedWave 1.3 for free during 30-days trial period. After this period you gonna have to buy TwistedWave 1.3 software for $49.90 or uninstall the program. TwistedWave 1.3 supports different languages (including English). It works with Mac. Latest TwistedWave 1.3 does not contain any spyware and/or advertise modules, allowing installing it with no worries concerning valuable information loss. We has completely tested audio file recorders software TwistedWave 1.3 many times, written and published the interesting article and uploaded installation file (9133K) to our fast server. Downloading TwistedWave 1.3 will take minute if you use fast ADSL connection. FileLab Audio Editor is a free program to edit audio files in the browser.